If you’re looking for the best option to keep providing quality service on your calls to your customers, and uninterrupted connection? 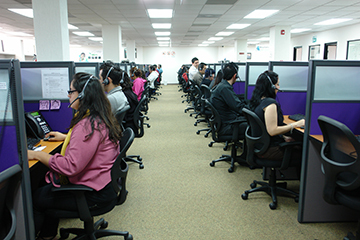 it is important for you to identify on your call center provider if it has a robust technology platform, so you can have a clear communication, continuous and close relationship with your customers, you also need to verify if the building is equipped properly if external mishaps like a blackout so on. Also it is vital for you to enquire what do you expect and want to accomplish with your provider, because there are different options, one of which is that you can lease the space (Co-sourcing) and you manage your own program and the other is that the Call Center can manages your operation (outsourcing). If you want to manage your operation with your own team, you hire the services of co-sourcing, you lease the space with workstations equipped with computer, telephone and headsets, manage directly your operation (personnel and metrics performance). If you want the Contact Center manage your operation, there are several solutions with which your call center provider can save you a headache when you are selecting the right personnel, training, supervision, quality call recording.